So here we have the newest member of our family. He's had a busy afternoon, watched a movie, been stroked constantly by Jo, and is currently being entertained by my very random mp3 playlist. 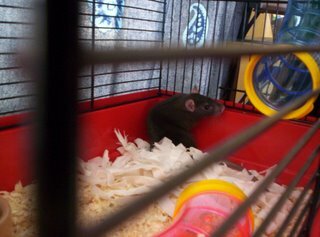 And no, I don't mind Rats at all - they're very cute to be honest, easily trainable, clean and if handled right, a good pet for a kid as they are somewhat more... robust than your run-of-the-mill gerbil or hamster. And yes, you can click the photo for a bigger version. He's cute... in a disgusting rat kind of way. I bet he's a real rat pin up. Oh he is lovely. Currently asleep in his food bowl, so clearly not the Super Rat that is going to take over the planet.